A food item is cooked when it reaches desired cooking temperature. What determines that the item is cooked is not time per se but certain time is required for the center of the food item to reach desired cooking temperature. Once the center reaches the target temperature, the item is cooked to desired doneness but there are other reasons why you may want to hold the food at this temperature for some time. We'll get to this later. The degree of temperature accuracy needed depends on the type of food. 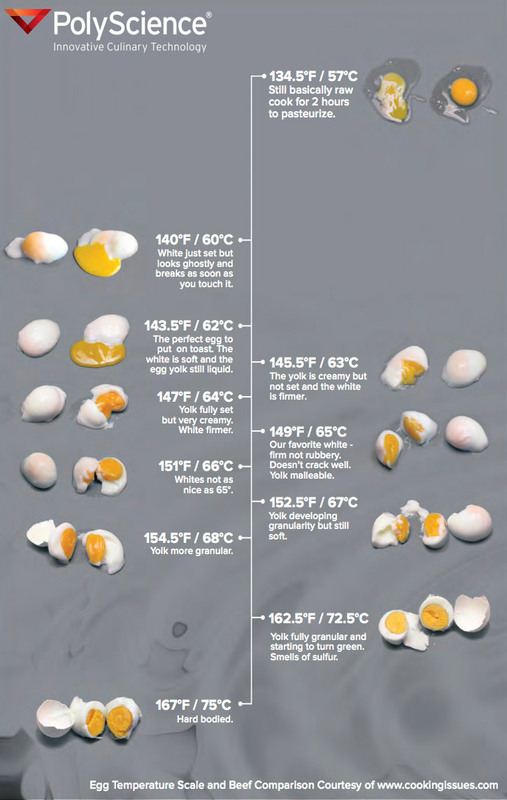 Some foods are not affected much by a few degrees but for others, such as eggs, precise temperature is critical and one degree can make a huge difference. In traditional high-heat cooking, to food is generally exposed to higher temperatures than the desired internal cooking temperature. Heat from the outside penetrates the food and before its center reaches final desired temperature by a few degrees, the food must be removed from the oven, grill or stove-top. Since the areas closer to the edge of the food will be at higher temperatures than the center, heat will continue traveling to the center and raising the temperature, hopefully to final desired doneness. If you remove the food too soon it will be undercooked and it you wait too long it will be overcooked. Even if you master this technique, the food will never be evenly cooked as the edges will always be at higher temperature than the center. In traditional cooking, it is also hard to precisely control temperature. In standard ovens, a sensor measures the temperature inside the oven and turns the heating element on when the temperature drops too low. The control is usually a simple on/off mechanism. As a result, the temperature inside a normal oven usually fluctuates around the set temperature. That is, if you set an oven to 400°F/204°C, the actual temperature inside the oven might be between 380°F/193°C 420°F/215°C. This range might be good enough for some applications, but other ingredients demand a more gentle touch. Air is also a bad heat conductor, so the temperature inside the oven is not necessarily the same everywhere. In sous vide cooking these problems are resolved. The food is immersed in a water bath which is held precisely at the desired cooking temperature. - Water, which is a great heat conductor, much better than air, plus the immersion circulator included in most sous vide equipment, ensure that every spot in the bath has the same temperature. - A PID controller, an essential part of any sous vide equipment, precisely controls the temperature of the bath. Much, much better than the simple on/off mechanism of an oven. - Sous vide cooking continues until the center of the food reaches the target temperature but if it stays longer in the bath, the food will not be overcooked because the temperature will never rise over the target temperature. - Food will be evenly cooked from center to edge because the external temperature is exactly the same as the targeted cooking temperature. How does a PID controller work? 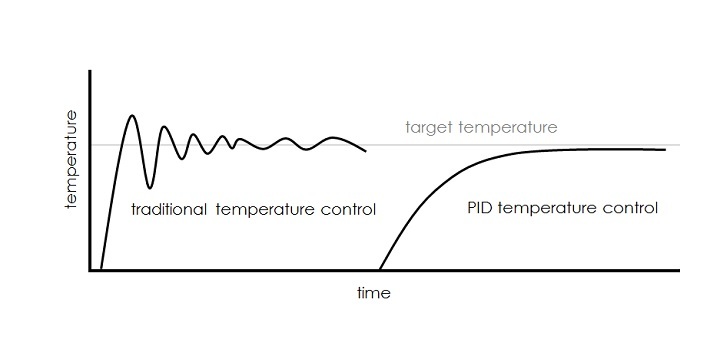 A PID controller relies on proportional, integrative, and derivative logic to estimate changes in temperature and prevent them before they occur. It accomplishes this by remembering how temperature changes in response to turning a heating element on and off. As a result, PID controllers can maintain a much more precise temperature than traditional temperature controllers. Most can easily manage +/-1°C of resolution and some can control as precisely as +/- 0.01°. The below graphic illustrates this. The temperature and time that you cook your food at depends on the food, the texture that you desire, and if you’ll be serving anyone who’s immune compromised. The time it takes for the center of the food to reach desired cooking temperature depends on the initial temperature, thickness and shape of the food item and the temperature of the bath. But when cooking sous vide, it is sometimes necessary to hold the food at desired target temperature for some additional time for a few reasons. - Tenderize tough meats, for example beef brisket and short ribs, benefit from longer cooking times. As Douglas Baldwin taught us, tough cuts can be made tender and still be a medium-rare to medium doneness by converting collagen (the connective tissue that holds muscle fibers, bones, and fat in place) into tender gelatin by holding the meat at between 130°F/55°C and 140°F/60°C for six hours to three days. At below 140°F/60°C, enzymes (such as collagenases) can significantly increase tenderness after about six hours. Above about 130°F/55°C, heat will begin breaking down collagen into gelatin and reduce inter-fiber adhesion; the amount of time needed to tenderize decreases exponentially as the temperature increases, so it’ll take about 2 days to make a chuck roast fork-tender at 130°F/55°C and less than an hour in a pressure cooker. For more information, see §2 of his guide or his review article. - Pasteurize the food by holding it in the water bath until any foodborne pathogens have been reduced to a safe-level. This only works if target cooking temperature is above 126.1°F/52.3°C. Below this temperature, food needs to be served immediately and it won't be pasteurized. Pasteurizing is required for the Cook - Chill - Freeze - Reheat sous vide method that we explain in Finishing Food After Cooking Sous Vide lesson. More on this at the end of this article. There is also a maximum time that you can hold the food in the sous vide water bath and it varies by food type. In some foods, such as chicken, fish and some tender cuts, enzymes may cause a mush-like texture if hold in the bath for too long as they break down too much of the connective tissue and inter-fiber adhesion. Chicken becomes mushy after about 4 hours while for fish it may be just a few minutes. For this reason, fish and tender cuts usually just need to be brought up to temperature and then served. As Douglas Baldwin explains, this frequently means that fish and tender cuts cannot be pasteurized — that is, reduce any foodborne pathogens to a safe-level — and made safe for immuno-compromised people. Some tender cuts, such as poultry, should always be pasteurized since they’re likely to make even healthy people sick. Beef and tougher cuts can be hold in the sous vide bath for long times and they usually benefit from this as explained before. Over time the connective tissue in the muscle will eventually weaken, but such a change might take days at such low temperatures. First, keep in mind that any food preparation must consider safety first. No matter what temperature you end up choosing for your application, make sure you follow the guidelines created by Douglas Baldwin, below. If you’ll be serving someone who is immune compromised, then it’s important to pasteurize the food by heating the food to above 126.1°F/52.3°C and holding it there until any foodborne pathogens have been reduced to a safe-level — see §1 of his guide for detailed information. Like the reduction of collagen into gelatin, the time required to reduction foodborne pathogens to a safe-level decreases exponentially with temperature. The amount a pathogen has been reduced is measured in decimal reductions, so a 6D reduction of Listeria monocytogenes has reduced the number of L. monocytogenes by 1,000,000:1. 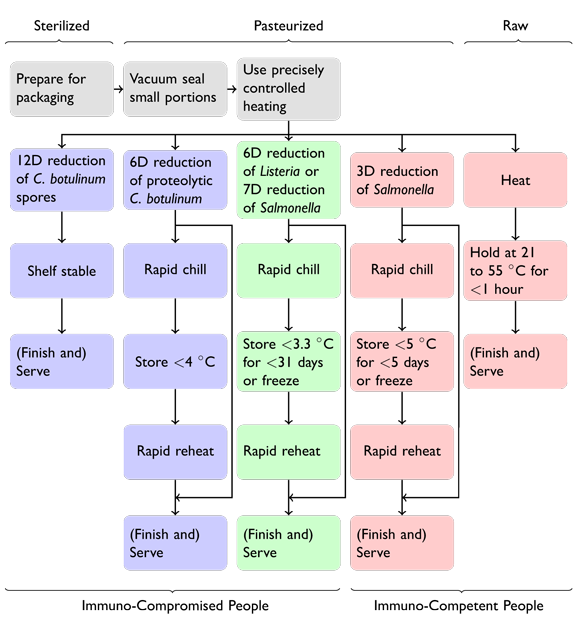 See the flow chart below of the various types of sous vide cooking based on the the severity of heating. For more information on this chart, see Douglas' original post. There are as many ways to cook sous vide as there are ingredients, but we've gathered up a few useful guides to get you started. 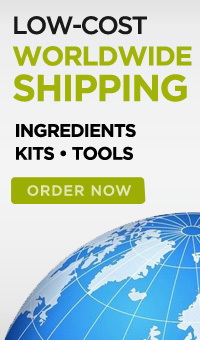 Our friend Douglas Baldwin has great resources for sous vide knowledge at his website. The Sous Vide Supreme company shares ideal times for meat, vegetables, and fruits. Codlo shares a handful of nifty infrographics covering the most common meats and vegetables. David Arnold, then working as the Director of Culinary Technology at the French Culinary Institute, performed an exhaustive series of tests on sous vide cooking.